A collection of crowd-sourced ambient sounds from around the world. 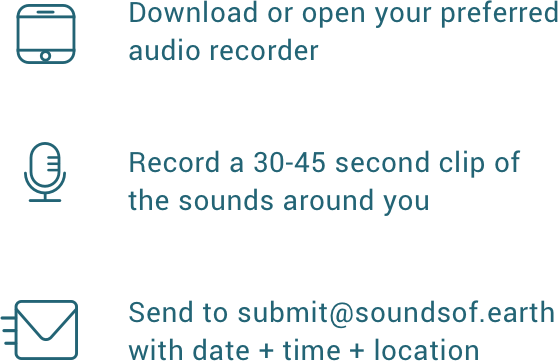 If you would like to contribute, record a 30 second sound clip of your location and send it over to submit@soundsof.earth. Be sure to include the location (city and street) and time it was recorded. This is a collection of sounds from different parts of the world. Right now, I’m collecting sounds from cities but I’m open to other sounds as well. Where should I ideally record a clip? Anywhere. Really, anywhere. A busy street, a quiet suburb, the mall, your balcony etc. These are in-the-moment captures of the sounds around you and not something you prepare for. Do I talk during the recordings? No. Please don’t talk during the recordings. Murmured or distant conversations in your surroundings are A-OK.
How long should a clip be? 30-35 seconds is ideal. When they are listed on the website, they will be trimmed down to 30 seconds. Because longer clips are boring. How do I record these? iPhones have a Voice Memo app that is perfect for this. Samsung phones have Samsung Voice Recorder app. Easy Voice Recorder is an Android app that has great reviews. There are tons of sound recording apps out there, use anything that you like. How do I submit clips? Mail them over to me at submit@soundsof.earth. Don’t forget to include the location & time of day it was recorded! Why send an email? Why don’t you have an upload functionality? I have some technical restrictions right now. As soon as I figure those out, I’ll add this functionality. What kind of files are you looking for? m4a and mp3 are file formats that I prefer but you can send over wav, acc, ogg, wma, etc. Not a lot. This is just repository. Do you plan on selling my clips? Do you plan on monetizing this? Hasn’t this been done already? Well then I’m doing another one. What’s the future of this? Oh, I have so many plans! For now, I’m keeping it simple. Expect new features and upgrades every month. Why don’t you have _________ functionality? I’m trying to keep it super simple right now. But I’m open to ideas. Send them over to mail@soundsof.earth. This is cool. Can we collaborate? Yes, of course! Get in touch at mail@soundsof.earth.